I don't think I can write today without acknowledging the date...I am still sad for all of the people whose lives were so tragically affected by the horrible events on September 11. My son flew home from New York today and, now that he is safely here, I will tell you that I was scared to death. Remembering 9/11 reminds me to focus on and be grateful for the many blessings in my life. My family, my kids, my work, my tomatoes, all of which I love so much. How lucky am I that my family and friends not only accept my obsession with these little bites of sunshine, even more, they support and encourage it? My tomato plants are in a state of indecision...some want to think they're finished. They've really produced well this season and are a bit weary from the extreme heat we've had in the San Fernando Valley for the past couple of weeks. But there are flowers on the plants that have survived the heat and green tomatoes which hopefully will ripen. This week I planted some short season varieties hoping to have tomatoes to harvest in the fall. Next I'll cut back the plants that look done in the hopes of giving them a second wind. They'll be fed well and I will talk to them sweetly to encourage them to produce for me. The heat does nasty things to the tomato plants so I didn't have much for a tasting today. I decided to only try one tomato this morning. It was the first time I had taken a bite of White Beauty. It hasn't been a great performer and the dog has enjoyed harvesting what it did produce long before I could pick them. White Beauty is really a pale yellow, small-ish tomato. The flavor was fine...not sugary, not tart, just fine. Maybe like the color of it's skin, White Beauty is a little bland. It would be a good tomato to include in a salad composed of stronger tasting tomatoes. It would add volume but wouldn't fight with the other flavors. I could use this tomato in my gazpacho which I make with a blend of whatever happens to be ripe and available that day. Today I have been reminded to cherish and nurture those things which I love. Growing tomatoes is just one of them. So tonight, as I say my thank yous to whoever is listening, I'll be sure to express my gratitude for the opportunity to do something which strengthens my spirit, warms my heart and feeds my soul. And you thought I was just growing tomatoes. Are you ready to plant your tomatoes? 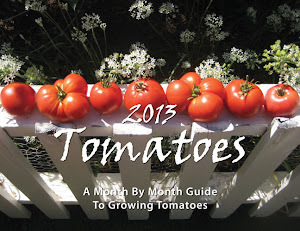 2013 Tomato Growing Guide and Calendars are available! Every tomato lover will want to have this one-of-a-kind guide to growing tomatoes anywhere in the U.S. 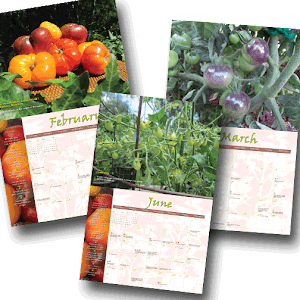 The 2013 Month by Month Growing Guide and Calendar goes far beyond being a traditional calendar by following the tomato growing season. It's color-coded for eight different climates, so that it can be used whether the tomato enthusiast is in Southern California or South Carolina! It includes delicious tomato recipes, gorgeous photographs and additional tips for the home gardener, both during the season and in the non-growing months. Make your next tomato growing season your best yet! Buy your 2013 calendar today - just $20 plus $2.95 shipping! New classes are added regularly. Check back often. Don’t see the class you’re looking for or need a different time? Please ask and we’ll try to accommodate. I love gardening, cooking, entertaining, and needlepoint (to name a few things)! It also happens that I enjoy teaching - my greatest pleasure comes from a student having an "a ha" moment. It's all about bringing people together to feel warm and comfortable. Put all that together with my fondness for paper and texture, my 17 year old stationery business, and you'll see how Laura Taylor At Home all comes together. Fact is, there's lots to love at home. Sharing my passions and teaching you how to do the same, is my gift to you.